Project: Alibi – your scary Hallowe’en rabbit hole! Q: What is Project: Alibi? Steve: Project: Alibi is a comedy/sci-fi/horror story that will be told primarily via social media. Just as you follow your friends, keeping up with their day-to-day lives, so you’ll follow the hero of the story…and as things turn weird for him, they’ll turn weird for you to. It’ll play out in real-time over 7 days. Alison: What Steve said! Think World’s End meets Rocky Horror meets X-Files with a sprinkling of Inside Llewyn Davis and a creepy peppering of ‘something more’… It’s FREE and you can dive as deep into the rabbit hole as you choose. Q: Why did you choose to go down the horror-path? How creepy will it be? Alison: There’s a lot of fun to be had around a recognised annual celebration date that’s so widely recognised. Hallowe’en is a fun time and an event that playfulness lends itself to so well. So, that, coupled with the tension, pace and mischief that we knew we could cause with the horror genre. Horror works partly because we fear the inhuman and great horror stories reduce people – which is where fear and ‘the unknown’ steps in. In all great horror stories, at some point, the ‘monster/inhuman’ becomes the hero and there’s a constant pressure and tension to be upheld. It’s incredibly exciting to write and we’re working on ways to make our hero (Talbot Griffin) become enslaved by his own weaknesses….. It’s very exciting! Q: You’ve already succeeded in crowdfunding the project but are reaching for stretch goals. How important is it to crowdfund? What are the biggest benefits of going the crowdfunding way? Steve: Well, originally we were just going to do it entirely out of pocket. But then as we dug into the story and experience we wanted to design, we realized we could do some really fun stuff if we could raise a little bit to offset some hard costs. So we went the crowd funding route. Plus, and just as importantly, I think crowd funding is a great way to take the temperature of an audience, see if they’d even be interested in a digital Halloween story in the first place. Lucky for us, folks seem to be very enthusiastic! Alison: The biggest benefit of crowd funding are to gauge audience interest at early development/concept phase. It’s been very reassuring to see such support for Project: Alibi, but crowd funding also makes you ‘own’ your work more. You know that people are waiting for you to deliver (and we will over deliver) on our promises and whilst we’d initially intended to fund this ourselves on a very limited budget we realised that a little influx from crowd funding would allow us to punch it up a little and create some more creepy awesomeness. Q: You’re mentioning an unnamed social network as being key to the experience – what are the major challenges when it comes to using social media for creating experiences? Steve: The major challenge I’m trying to design against this time around is that usually social media (or cross-media) projects are honestly tough to follow. If the content is all over the place, that means you have to look all over the place to find it. This is a pretty big barrier to entry. So our idea is that, to be able to take part in the story, you just have to follow ONE guy. It all takes place from his POV (and through his own mobile device) anyway, so this seems a natural way to do things. Now, we’ll have this content radiate out to other platforms to give you a choice, but it will all originate from basically one place. And you can just sit and receive, like we’re programmed to, or you can optionally dig a little and find even more content if you’d like. It’s there if you want to find it, but you don’t need it to have a good time. Q: Why should I join Project: Alibi? Alison: Hallowe’en is a social time – I mean, who sits at home alone dressed up as Dracula or a ghoul, right? 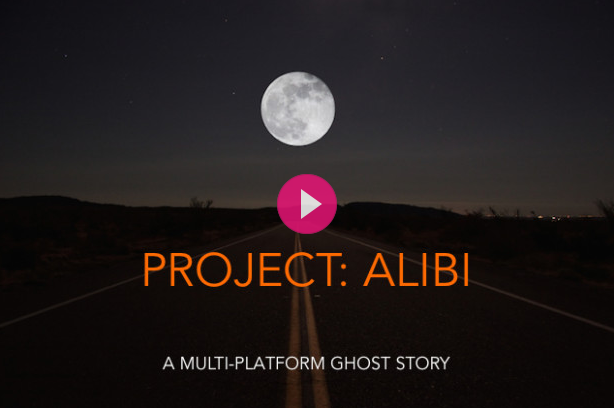 Project: Alibi is being created so that you choose how far you want to go, even if you are sitting at home alone. It’s easy to follow, free and a pacy and fun way to learn more about our complex hero Talbot Griffin and the events that lead up to, and ultimately decide, his Hallowe’en fate. The question is, how impactful will your choices be as to that fate…….